Summary: Burdened by a dark family secret, Virginia Fortescue flees her oppressive home in New York City for the battlefields of World War I France. While an ambulance driver for the Red Cross, she meets a charismatic British army surgeon whose persistent charm opens her heart to the possibility of love. As the war rages, Virginia falls into a passionate affair with the dashing Captain Simon Fitzwilliam, only to discover that his past has its own dark secrets—secrets that will damage their eventual marriage and propel her back across the Atlantic to the sister and father she left behind. Virginia Fortescue is recently widowed, has just endured a very public trial of her father in her mother's murder and has a looming, long-standing mystery to contend with as well. The mystery is as much about who her husband Simon really was, as how he came to die in an inferno at his beachside villa. She arrives in Florida with her young daughter and so begins the tale with rum runners, a US. Marshall, former dilapidated plantations, tony seaside enclaves and secrets, lies and more secrets about lies. We're taken on the journey in three different ways, the courtship of Virginia and Simon in WWI France where she drives an ambulance and he's a physician; the present & in past letters Simon's written to Virginia. The mystery really propelled me through this story as I wanted to know the truth and didn't trust most of the people surrounding Virginia. She had her own credibility problems but I wanted the truth for her. I was surprised just how many lies the Fitzwilliams were living with and how deeply the damage ran. From about chapter 21 to the final line, this is a pretty gripping read and because adulting is a required thing, when I had to put the book down, I did so grudgingly. The epilogue was a good tie off and also dropped a kernel that made me think there may be another book coming. 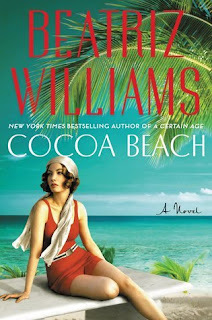 This was my first read by Beatriz Williams. While reading I found out that this book is part of a series, I wished that I'd read the prior book. Alas, I found that I had three other books by Williams on my TBR that I bought. Two that are part of another trilogy (The Schuyler Sisters) and finishing this prompted me to buy the one I was missing (Tiny Little Thing) so those will be the next I read by her. I definitely recommend Cocoa Beach. Even if, like me, you haven't read the others in this trilogy, it holds up well as a standalone historical fiction. Thanks to HarperCollins through Library Thing Early Reviewers for a copy of this book in exchange for my unbiased review.